It’s a curious thing. When you drive out west, wind turbines practically fill the horizon. They’re as much a routine part of the landscape as any other tall man-made object, like a radio station’s antenna or a high-power transmission line. But come east of the Appalachians, and wind turbines seem to be a rare sight indeed. I notice it especially because I have a wind industry stock in the Total Wealth Insider portfolio that’s performed very well for subscribers. More turbines mean more profit, and hopefully even higher prices for the stock. But that’s beginning to change. North Carolina, for instance, has 208 megawatts of installed wind power capacity. That’s due to one commercial installation that just started spinning at the end of last year in the northeastern section of the state. It’s called Amazon Wind Farm U.S. East (part of a renewable energy drive by Amazon Web Services). Located in rural Perquimans and Pasquotank counties, the wind farm hosts 104 turbines turning in the coastal breeze. They put out enough electricity to power the equivalent of more than 60,000 homes. But the wind farm’s story shows the difficulties of locating wind turbines in the relatively crowded confines of the eastern U.S. The local congressional delegation fought the project, though nearby landowners and local political leaders welcomed the $400 million investment in the local economy. The breezes in North Carolina don’t blow as strong as out west either. 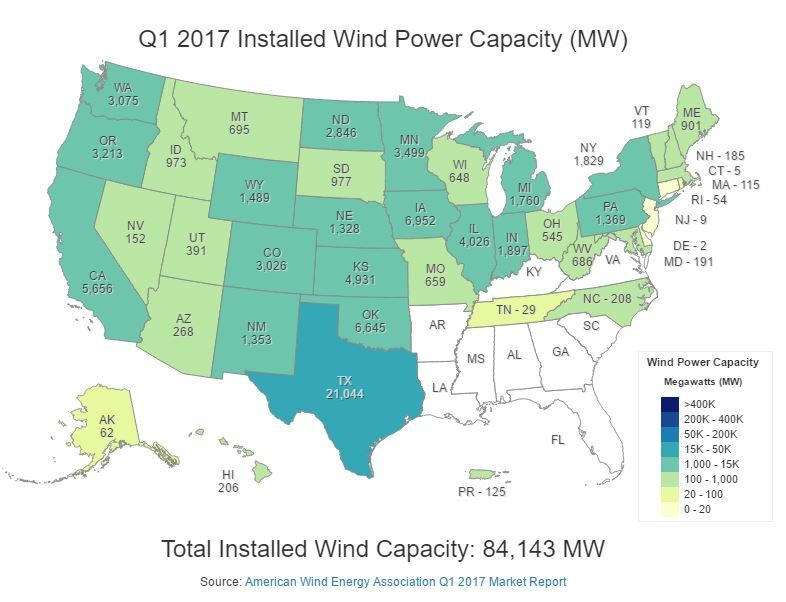 The Energy Department rates potential power-generating capacity for U.S. states based on the consistency of local wind conditions. Most eastern states rate between 1,000 to 50,000 megawatts of capacity. Compare that to almost the entire swath of western states, which rate from 200,000 megawatts up to 400,000 megawatts or higher. But the evolving technology of wind power might change that equation too. Winds are faster and more consistent the higher you go off the ground, and that’s especially the case in the heavily forested eastern U.S., where the massive amounts of trees create lots of friction with the surface winds. But researchers say a turbine roughly 600 feet tall (roughly 100 to 150 feet taller than current new installations) would make wind power economical in much of the Southeast. Of course, just because it can be done doesn’t mean it will be done. Residents, local leaders and Mother Nature (hurricanes, anyone?) will all have their say. But wind power crossed an important threshold last year when it surpassed hydroelectric power (despite a 70-year head start in dam construction) to become the biggest source of renewable energy in the United States. The tall-and-taller turbines of the future will only cement wind power’s place as an increasingly important part of the U.S. electric grid. P.S. Paul Mampilly has been thoroughly analyzing the energy market for the last few months. And through his research, Paul found a Fortune 500 company with true momentum that’s about to surge 700%. Click here to get on the True Momentum VIP list and find out how you can invest in this company before the rest of the world knows how profitable it will become.